It’s common when referring to an acclaimed contemporary food writer to compare them to Julia Child. But while eminent food historian and cultural anthropologist Maricel E. Presilla has certainly earned the accolade, she’s closer to a culinary Indiana Jones. Whether journeying to the basin of the Orinoco River to make casabe, preparing chuño (freeze-dried potatoes) with Andean women by the shores of Lake Titicaca, or mapping the first cacao trail of the Americas, Presilla has traveled to the ends of the earth to better understand the way food shapes Latin America. It's a joy to follow her there. Born in Santiago de Cuba, Presilla emigrated with her family to the United States where she pursued her doctorate in Medieval history at New York University. A stint in famed Peruvian chef Felipe Rojas-Lombardi’s Ballroom restaurant in Chelsea pulled her away from academia and brought her into the kitchen. Presilla went on to open Hoboken’s popular Zafra and Cucharamama restaurants followed by a cooking atelier, launch a cacao importer, and found the International Institute of Chocolate and Cacao Tasting. A prolific writer, her book Gran Cocina Latina: The Food of Latin America, became the definitive work on the region and was chosen by the Beard Foundation as their Cookbook of the Year in 2013. She was inducted into the Foundation’s Who’s Who of Food and Beverage in America in 2015. Her latest book, Peppers of the Americas: The Remarkable Capsciums that Forever Changed Flavor, was partly informed by her trip to the archaeological site of El Brujo near the city of Trujillo in northern Peru while on assignment for Saveur where she saw archaeologists of the Moche Foodways Archaeological Project examine ancient pepper seeds excavated in the region under the microscope. "I already knew that the famous archaeologist Junius Bird of the American Museum of Natural History in NY had found important pepper remains and seeds buried in Huaca Prieta, an earth mound that is part of the El Brujo complex, during his 1946-1947 expedition. I saw a dark earth mound and gigantic adobe pyramids emerging from this plateau, contrasting with the green of sugar cane fields and the gray and mysterious water of the Pacific. But when you walk in that archaeological site, you’re walking on bones and pottery. You see fragments of shrouds floating in the air because people were buried around these pyramids,” says Presilla. "Seeing local women gathering seafood at the beach by Huaca Prieta and cooking them with hot peppers brought the ancient history of peppers to life. The experience left me wanting to know more." You don’t expect a botanical ethnography on peppers to send shivers up your spine, but "Peppers of the Americas" does just that. With academic rigor, Presilla examines the Capsicum genus’ pre-Hispanic origins, delving headlong into the epic collision between the Old and New World that sent peppers across the globe. 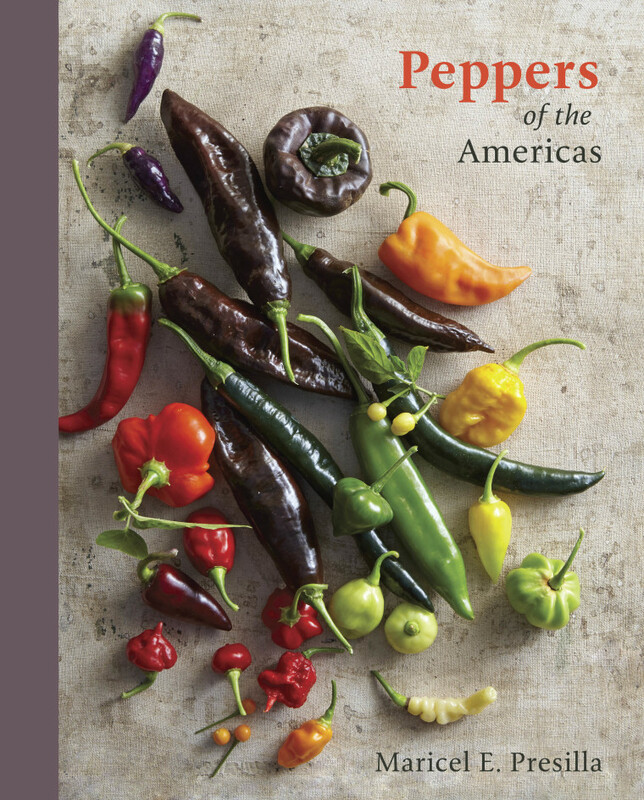 An avid gardener, Presilla grew nearly all of the almost 200 peppers featured in the book, beautifully photographed by Romulo Yanes, in her home in New Jersey, a backyard laboratory featuring fiery ají guaguao from her native Cuba, challenging chiltepines from Sonora and deep purple Peruvian panca peppers, to name only a few specimens. “I was interested in developing peppers that I had found in markets and farms throughout Latin America coming to life in my house,” explains Presilla. After spending time with this book, you’ll seek out these jewel-toned beauties too. In addition to the encyclopedic history, Presilla includes an extensive gallery of fresh and dried peppers, a guide to growing your own, and a slate of pepper-based recipes to try. I spoke to Presilla about why she set her sights on peppers, whether the insatiable demand for exotic peppers is a lifeline or a threat to the producers of the coveted capsicums, and which Latin American peppers are poised to cross over next. Below is our slightly condensed interview. Why did you decide to focus on peppers as a single subject? If you look at Gran Cocina Latina, you realize it’s a collection of in-depth, monographs of staple foods of the Americas. Peppers are something that I treated in Gran Cocina and you’ll see peppers everywhere in the recipes. It was almost a necessity to give in-depth treatment to a very important iconic plant of the Americas that really changed world flavors. I’m interested in the plants of the Americas that were taken elsewhere and changed the way people eat — think about potatoes, tomatoes, cacao turning into chocolate, vanilla in European cuisines. It made sense to me to work on peppers because of their importance. How does the increased demand affect the quality of the peppers we’re consuming and does it hurt or help smaller producers? It’s a reality of the world economy. To give an example, the piquillo pepper from Spain where land is expensive, labor is expensive, and the number of farmers willing to dedicate their land to peppers has decreased. In Peru, piquillo peppers can grow in a desert land with good irrigation. It's been there since time immemorial, they know how to irrigate, and how to create an oasis out of these wastelands to grow piquillo peppers, asparagus and artichokes to sell to Spain, the European market and the US. The piquillo peppers that you use in a recipe might be Peruvian and not from Navarre. The peppers from Peru are fantastic, but obviously there are some that would claim the ones from Spain are the best — what have you. The reality is that [Peruvian piquillos] are really delicious. These companies have a lot of foreign capital, so we think that it’s just Peruvians, but there are Spanish [companies] involved in all of that. The guajillos from Peru are also very good and they go to Mexico. I’m more forgiving about this whole pan-American exchange than I am with the Chinese flooding the markets with their products because they don’t have the same relationship to these products, they don’t have the same care. Even in Mexico it happens. For example, chile huacle is a very elusive chile that tastes like a dry prune, has beautiful color and delicious flavor. The farmers in La Cañada are getting old and they’re not planting as much chile huacle as they did decades ago. What happens is that the chile huacle from La Cañada is expensive, but if you go to the Benito Juárez market in the city of Oaxaca, you’ll find chile huacle that’s inexpensive from Zacatecas. People who have the products of that terroir, value that, and they’re incensed with what they consider to be unfair competition. But that’s the nature of agribusiness today. You reference Cuban peppers often, though they’re rarely associated with Cuban cuisine. Why was it important to you to reclaim peppers for Cuba? It’s just that the taste changed and it changed most dramatically when people from northern Spain began to settle in Cuba because they didn’t have a tradition of spicy foods. But we ate tons of sweet peppers in Cuba and ají dulce or cachucha, which is Capsicum chinense. It has the same flavor as the habanero, but it’s sweet. Not only that but we gave the Yucatán the habanero; it was not a misnomer, it was not a Mayan pepper, it came from Cuba. It was probably called habanero because trade between the Yucatán and Havana was very strong, especially through the port of Campeche. That’s how this hot pepper entered the Yucatán. If you read some of the botanical sources from Cuba from the 19th century, a bunch of hot peppers are listed. The so-called dátil from St. Augustine, which is the only chinense of the U.S. with history and pedigree, didn’t come from Minorca. The people of St. Augustine had created this legend that it came from Minorca. No such thing. All the recent research says it was brought from Santiago de Cuba, and I found sources saying that there was a hot pepper called dátil and it’s described. So yes, we have an important role to play in the history of hot food. What do you think the next pepper to cross over into the United States will be? Last year there was a change in the policy and Peruvians were allowed to export [fresh peppers] to the U.S. There are regulations because they need to be grown in greenhouses in certified places, so obviously there is a whole thing about cultural protection. Once we get fresh [Peruvian] ají amarillo, people are going to fall in love because it has just the perfect heat — it’s not overwhelming, it’s very fruity, it’s delicious, it’s gorgeous, it’s versatile. We’re also going to get fresh rocoto. I don’t know if we’re going to get Amazonian types because those are grown in very small farms, and even if you go to Peru, they’re difficult to find. It all has to do with exposure. People are writing about these things. This is how trends happen. It’s like the habanero which is so common now. You couldn’t find habaneros anywhere and now they’re everywhere. The book’s multi-disciplinary approach reflects your academic background and training. What was it about food history that captured your imagination? I think I get swayed by moments, and if they feel right I just go along, I don’t fight fate they way other people would. I come from a family of gardeners but also great cooks. So you’re not going to fight that DNA imprint. I was in Spain and traveling through all these incredible towns where medieval castles and monasteries were, and the food was great there, so I paid attention to that. I took notes as a researcher of these incredible ingredients that I found. So in a way I had this parallel interest in food and history but never thinking that I would leave one thing for the other. It never entered my mind.